Marcus Johnson, a 12th-grader at the Tennessee School for the Blind, takes a timed test on interpreting charts and graphs, typing his answers into his Braille writer. Reading isn't usually a competitive sport. But it's become one for Braille readers because of a lack of excitement about Braille. Right now, the Los Angeles-based Braille Institute is putting on regional competitions like this one in a classroom at the Tennessee School for the Blind. A braille reading competition actually looks more like a typing contest. As competition begins, students flip through their packets. Their spread fingers sweep over the square pages. In some events, they proofread Braille. But in this session, they interpret charts and graphs, typing their answers into mechanical nine-key Braille writers. The old-school equipment is akin to taking a math test without a calculator these days. Digital technology, especially a computer's ability to read text aloud, makes Braille seem more and more antiquated. But 12th-grader Marcus Johnson finds it a necessary skill. "Because you cannot use technology for every aspect of education, so sometimes you just have to have that physical writing there," he says. For Johnson, there's also something about the written word, even in an alphabet of dots. "To me, it's kind of reminiscent," he says. "I've had vision before in my life. I lost my vision while I was young. But it kind of just helps to bring back the feeling of actually having a physical book." But it's not easy, even for someone who's been blind since birth. Sydney Walker made her middle school-aged son learn Braille as a baby, putting raised labels on things all over the house. "It wasn't easy, I'll say," she says. "I think some people have the idea that if you're born blind, you're automatically going to be great Braille reader." It's far from automatic. And Braille literacy has fallen to around 10 percent for children. "The kids are not wanting to do it because it takes extra time, and it's harder," says Joanne Weatherall, a retired teacher from the Tennessee School for the Blind. She's blind herself and comes back to be a scorekeeper each year. She says no sighted person would ever think they could forget about learning to write with a pencil and paper just because they type most of the time. "It should not occur to a blind person to not be where they can't write something down," she says. She says people might be entertaining the idea of getting through life without knowing Braille because it's easier and faster. "The only thing I would think is because kids that start out in school very young learning technology — it's very easy for them," she says. "It's faster than reading and writing in Braille because that can be very slow and cumbersome." This national competition that is fed by these regional events was set up 16 years ago as a fun way to make sure Braille didn't fall out of use. And Weatherall says she still has to convince students to compete. "What to do to really get the kids really charged up about Braille, I don't know because many of them hate it, which just makes me crazy," she says. 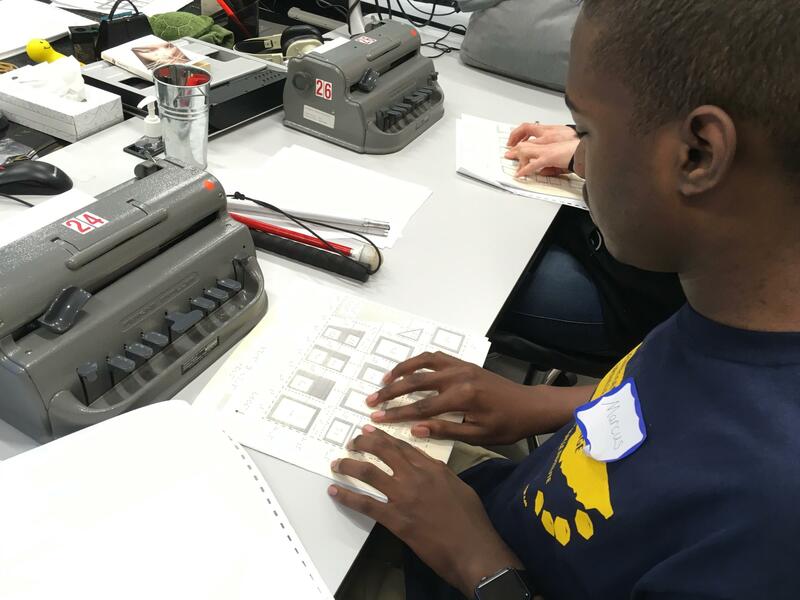 What makes Weatherall grin are Braille lovers like Marcus Johnson, who plans to attend a local university in the fall, though he says Braille will not be particularly useful in his college classes. Blake Farmer is the news director of NPR member station WPLN. You can follow him at @flakebarmer. If you've already filled out your brackets and need something competitive to watch between now and the first games of Match Madness, try reading - Braille reading. It's now a competitive sport of sorts. And as Blake Farmer of member station WPLN in Nashville reports, that's not because there's so much excitement about Braille but rather because there isn't. BLAKE FARMER, BYLINE: Right now, the Los Angeles-based Braille Institute is putting on regional competitions like this one in a classroom at the Tennessee School for the Blind. And a Braille reading competition actually looks more like a typing contest. UNIDENTIFIED WOMAN: Everyone have their paper in their machines? You may begin. FARMER: Students flip through their packets, their spread fingers sweep over the square pages. In some events, they proofread Braille. In this session, they interpret charts and graphs, typing their answers into mechanical nine-key Braille writers. FARMER: The old-school equipment is akin to taking a math test without a calculator these days. Digital technology, especially a computer's ability to read text aloud, makes Braille seem more and more antiquated. But 12th grader Marcus Johnson finds it a necessary skill. MARCUS JOHNSON: Because you cannot use technology for every aspect of education, so sometimes you just have to have that physical writing there. FARMER: For Johnson, there's also something about the written word, even as an alphabet of dots. JOHNSON: To me, it's kind of reminiscent. I've had vision before in my life. I lost my vision while I was young. But, I mean, it kind of just - it helps to bring back the feeling, you know, of actually having a physical book. FARMER: But it's not easy, even for someone who is blind since birth. Sydney Walker made her middle school-aged son learn Braille as a baby, putting raised labels on things all over the house. SYDNEY WALKER: It wasn't easy, I'll say. I think some people have the idea that if you're born blind, you're automatically going to be a great Braille reader. FARMER: It's far from automatic, and Braille literacy has fallen to around 10 percent for children. JOANNE WEATHERALL: And the kids are not wanting to do it because it takes extra time and it's harder. FARMER: Joanne Weatherall is a retired teacher from the Tennessee School for the Blind who comes back to be a scorekeeper each year. She's blind herself. She says no sighted person would ever think they could forget about learning to write with pencil and paper just because they type most of the time. WEATHERALL: It should not occur to a blind person to not be where they can't write something down. FARMER: Well, then why would people even be entertaining the idea of getting through life without knowing Braille? WEATHERALL: That is an excellent question. The only thing I would think is because kids that start out in school very young learning technology, it's very easy for them. It's faster than reading and writing in Braille because that can be very slow and cumbersome. FARMER: This national competition that's fed by these regional events was set up 16 years ago as a fun way to make sure Braille didn't fall out of use. And Weatherall says she still has to convince students to compete. WEATHERALL: What to do to really get the kids charged up about Braille? I don't know because many of them hate it, which just makes me crazy. FARMER: What makes Weatherall grin ear to ear are Braille lovers like Marcus Johnson, who plans to attend a local university in the fall, though he says Braille will not be particularly useful in his college classes. For NPR News, I'm Blake Farmer in Nashville. (SOUNDBITE OF CHARLES BRADLEY SONG, "TELEPHONE SONG") Transcript provided by NPR, Copyright NPR.